UCLA will receive $1 million in new funding from the National Institutes of Health as part of a global initiative to pool data about the human brain. The Enhancing Neuro Imaging Genetics through Meta-Analysis (ENIGMA) consortium unites brain researchers in 33 countries to discover factors that help or harm the brain. Started in 2009 by researchers in the U.S., Europe and Australia, the alliance studies brain scans and DNA from 30,000 people at more than 185 sites around the world. Data produced by the sites are analyzed by computing facilities working around the clock to detect the effects of certain treatments identify risk factors and highlight worldwide trends. The grant to UCLA is part of a total of $11 million being distributed by the NIH for new ENIGMA-related research. UCLA’s research is led by Carrie Bearden, professor of psychiatry and psychology at the UCLA Semel Institute for Neuroscience and Human Behavior, and Eleazar Eskin, professor of computer science and human genetics. One of ENIGMA’s objectives is to understand how disrupted genes affect brain structure, both in healthy individuals and in the context of neurologic and psychiatric disease. Bearden and her colleagues lead ENIGMA’s efforts on a neurogenetic disorder called 22q11.2 Deletion Syndrome, which greatly increases the risk for schizophrenia. Eskin and his research team are developing statistical methods for analyzing the ENIGMA data with the goal of integrating environmental information that may contribute to various diseases. 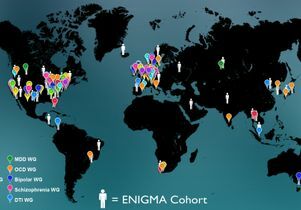 The funding for ENIGMA is part of a $100 million federal program announced in 2013 to support 11 National Centers of Excellence, part of the Big Data to Knowledge, or BD2K, initiative. BD2K’s goal is to discover patterns in large-scale collections of medical data that ultimately will lead to better diagnostic tools for dementia, schizophrenia and developmental disorders such as autism.